Bontoc – About 300 farmers from the different municipalities of the province attended a poultry development and production seminar at the Ridgebrooke Hotel and Restaurant last June 21, 2018 at the capital town. The activity was spearheaded by the Department of Agriculture (DA)-Cordillera Administrative Region (CAR) through its Agriculture Training Institute (ATI) in partnership with the Provincial Government of Mountain Province to boost the production of poultry for the farmers in the province. This is in support to National Livestock Program of the government. Dubbed as “Back to Basics – Scientific and Sustainable Livestock and Poultry Development Seminar,” the activity aimed to review the basic practices in poultry production that can benefit many farmers. This, as the government’s way of promoting the raising of free-range chicken and ducks to produce more meat and eggs that are healthy and locally produced. According to Dr. Anthony Bantog, Chief Regulatory Division of DA-CAR, the seminar is in line with the national government’s agriculture agenda to make food available for every Filipino family. “The government will be bringing the essential goods and services to the people especially those in the remote areas of the country,” he said. Bantog said that the conduct of the one-day training program is essential before the dispersal of free range chicken and itik-Pinas (ducks) for production to farmers in Mountain Province. He asked for the support of the local LGUs and urged the local farmers to sustain the project as it is observed that many livelihood projects that are given in the past were not sustained. 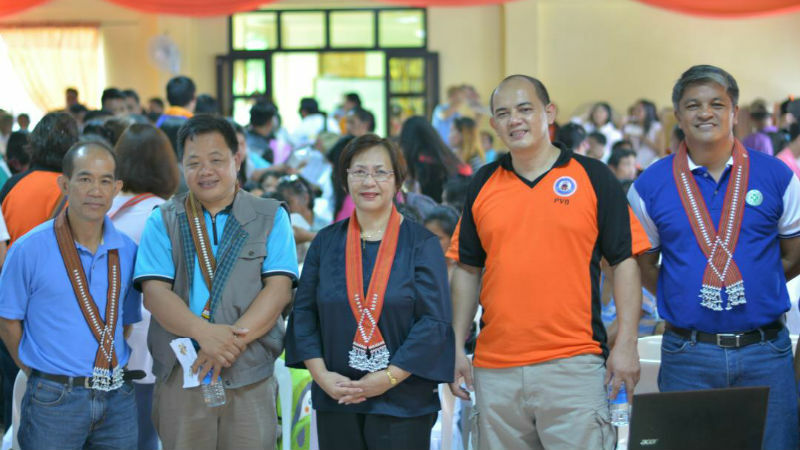 Also in attendance during the activity was ATI-CAR Assistant Director Myrna B. Santa Maria who encouraged the farmers to support the advocacy of the government to produce healthy food by intensifying the production of range chicken and itik Pinas in the Province. Once sustained, local farmers can have additional source of food and extra income when they supply their own locality with eggs or poultry meet. During the conduct of the activity, the participants were oriented on their responsibilities and benefits of the project. Lectures on duck egg production was delivered by Dr. Rene Santiago, Center Chief of the National Swine and Poultry Research Development Center (NSPRDC)-Quezon. Dr. Regina C. Villarama and Dr. Krestel Joy U. Isla of the Tarlac Agricultural University were also invited to discussed on free range chicken production. Under the poultry production program, identified farmers from the ten municipalities of the province will be receiving 10 female heads and 2 male heads of chicken or itik Pinas. The special feature of the program is labeled as “passing of the gift” since it is the responsibility of the first recipients to roll out the same number of chickens or ducks that they received to their fellow farmers or next-in-line beneficiaries, who will also do the same after producing offsprings. Dr. Rodelio B. Bagawi, Provincial Veterinarian, is hopeful that the participants learned a lot during the conduct of the seminar. He said that the impact of the activity will soon be felt by the farmers in the next few years when their production and income increases. Meanwhile, Executive Assistant June C. Pinayakan who relayed the message of Governor Bonifacio C. Lacwasan, Jr., expressed the appreciation of the Provincial Government to the advocacy campaign seminar and livelihood assistance that the local farmers will be receiving. He said that the seminar and the post-training support (itik-Pinas and free ranged chicken) from the DA are blessings which will augment the range chicks that the Provincial Government has been annually distributing to organizations province-wide and which will surely improve our farmers’ living conditions.